Demand for Seagate Extra Virgin Olive Oil has been exceeding our production capacity after our first two full seasons. We can attribute this to the high quality of the product and to the fact that this is 100% pure olive oil, without being cut with vegetable oil fillers and processed with great care. Not a big surprise — if you give people an good honest product at a fair price, they will not only return for more but will also tell their friends. The product reviews have been encouraging. However, we were faced with a difficult choice, either maintain the low level of production utilizing existing plant equipment and interrupted our regular production of other Seagate products, or install new machinery specific to olive oil. Below as an example of the extra labor that has been involved. This is the olive sorting table where several employees hand-select the olives and remove any residual leaves and twigs arriving with the olive from the farm. Imagine sorting through 2-3 tons every two days by hand. 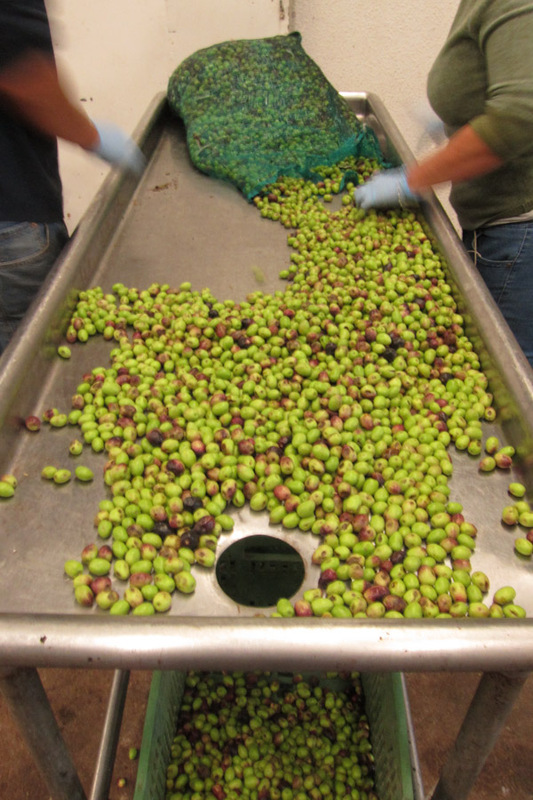 These olives were then fed into our stainless-steel rotary vacuum tanks where the oil is separated from the pulp. These tanks are a unique way to produce olive oil. Probably nowhere else in the world is vacuum used to extract olive oil. However, the real purpose of these tanks is for freeze-drying a variety of other Seagate’s products. We were faced with a difficult choice. 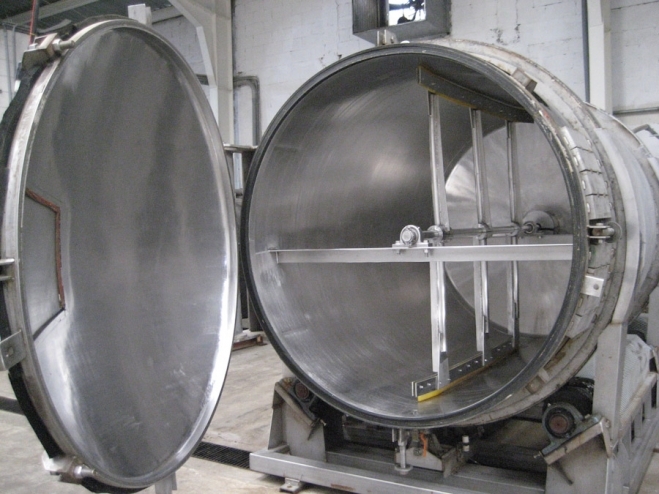 We could maintain the low level of production utilizing existing plant equipment such as the vacuum tank above to extract the oil, or we could take production up to the next level by adding new machinery. 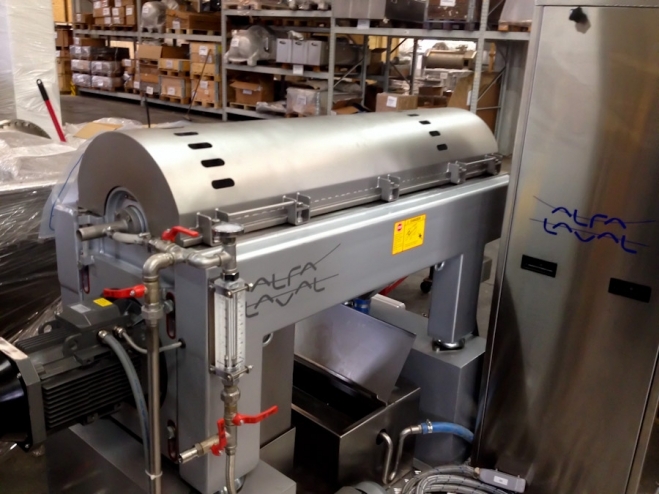 A visit was made to Italy in April to inspect an olive oil processing plant and finalize its purchase. (Such are the sacrifices we must make for the company.) The machine above is a decanter, which separates the fine solids from the olive oil and is one of 10 pieces of specialized machinery that were purchased. The olive oil equipment was shipped by boat in October to San Diego, and forwarded to the Seagate factory in Baja California, Mexico. The machine above, ready to ship on its pallet in Florence, crushes vegetable husks. In the case of olive oil production, it is part of the process of reducing the whole olives into a pulp. The olive oil press above will replace the vacuum tank and allow continuous programmed production, with an increase in capacity by 25x. The photo below is of a large sea anenome along the Sinai coast of Egypt. Distances underwater can be deceiving. It may look like this photo was taken from far away. However it was actually less than 6 feet from the camera. There is a some color showing inside the anenome. But most color is lost due to the distance that the light has to travel in water. Seawater absorbs colors very quickly. A basic rule in underwater photography is get closer to the object. If you think you are close enough, get even closer. The photo below is of the same anenome, but this time taken from less than 2 ft. away. From this distance, the camera does a much better job at capturing the anenome’s beautiful colors.